By some sort of strange paradox, my wife the Master Gardener tends to show enthusiasm for plants that in a short time become invasive weeds. She showed preference for epimediums, lamium, viola labradorica and, of more recent vintage, the aggressive clover-like oxalis. My own roses and hostas grow to maturity and know how to keep their place with the possible exception of a most vigorous Rosa sericea subsp. omeiensis f. pteracantha. The problem with Rosemary’s “weeds” is that they show their vigour early in spring and prevent slower plants from getting light. This means that many plants in our garden have succumbed, overcome by lack of light and invasive roots. Plants like Viola labradorica, epimedium and oxalis have a root structure much like that of an iceberg under water. What you see does not compare with what is underground! Now some plants may look like weeds and not be so. Two of those are the thistle, Echinops ritro and the thistle-like Eryngium. The latter and in particular Eryngium giganteum ‘Miss Willmott’s Ghost’ is a lovely biennial. This means that it flowers on its second year and then goes to seed. Somehow it has not reseeded itself and we have lost it. The current garden depression means that we cannot replace it. Of the former we have a very nice clump of Echinops ritro 'Veitch's Blue'. Once I had found in a plant sale a white version but it disappeared, overwhelmed by its more aggressive blue relatives. Echinops, is tall, stately and very blue. It attracts bees. You might not like its foliage. You might say it is weed-like. And yet through a scan I have discovered a beauty that was unseen up to now. It all began a few days ago when Rosemary, who was re-doing her sunny perennial bed instructed me to cut off a few of her marching-forward echinops to find room for other plants. I brought one of the pieces in. It was not yet showing any growth of the globe-like flower. 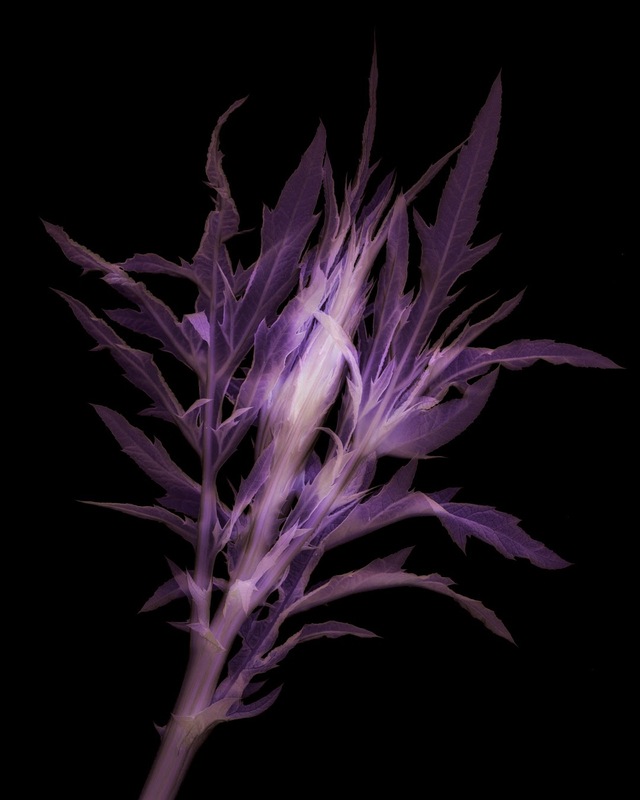 Instead of scanning it from the bottom as I do most other plants and flowers, I closed the lid on it and treated it like a transparency/slide.